Left to right: Christian Keesee, Jeanette Elliott, Cindy Allen, Rand Elliott, Renee and Stan Lingo. 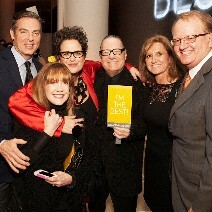 In December more than 900 people from the design community (designers and manufacturers) gathered at the Frank Gehry design, IAC Building at 555 West 18th Street in New York City for the 8th Annual Best of Year Awards. This program represents the preeminent design competition recognizing superior design projects and products for 2013. Project design winners were chosen by Interior Design Editor in Chief Cindy Allen and the magazine staff. The auditorium was standing room only, as the winners were announced live by hosts Cindy Allen and Mark Strauss, President and Publisher, using the IAC’s 80 foot video wall to present. This year’s Best of Year competition experienced record-breaking numbers: 1,800 submissions – 50 percent more than last year. Lingo Construction Services in Oklahoma City won Best of Year in the Office: Restoration/Renovation category. Located in the historic Automobile Alley District of Oklahoma City, the design transformed an existing 1930 historic masonry and steel building into a modern office space where transparent walls allow the construction process to be visible – Elliott’s concept called X-Ray. “We believe buildings are a tool that will allow businesses to meet their goals. Through the design and construction of this particular project, we are able to display our ability to execute a place of art, craftsmanship and functionality. This project is an example of not only the successful communication between owner and architect, but the victory of collaboration between architect, contractor and subcontractors. It is a joy to work in this environment and an honor to lead individuals through the space during their first visit,” said Stan Lingo, president of Lingo Construction Services. The Marfa Contemporary Gallery in Marfa, Texas was announced as an honoree in the Institutional: Arts category. The gallery is a satellite project of the Oklahoma Contemporary Gallery in Oklahoma City and allows Oklahoma Contemporary to expand operations into the southwest region of the U.S. By having a satellite gallery in Marfa, a town with a well-established reputation in the international art arena, it will stimulate further interest in Oklahoma Contemporary throughout the world. “It was probably one of the most fun evenings I’ve had in New York. Having Marfa Contemporary honored as a finalist in the ‘cultural’ category was so exciting. Many thanks to Rand for helping create such an exciting place in Marfa!” said Christian Keesee, chairman of Kirkpatrick Bank. Elliott + Associates Architects is an Oklahoma City firm with an international reputation for innovative design. Elliott + Associates is the only architectural firm in the history of the State of Oklahoma to win a National AIA Honor Award; and to date, the firm has received 10 National AIA Honor Awards. An international publisher of design, based in Milan, recently issued a hardcover monograph devoted to Elliott’s work, Listening to the Land. Established in 1976 by Rand Elliott, the firm has projects around the country. The firm’s work has been widely published in the U.S. and Europe. For more information on Elliott + Associates, please visit www.e-a-a.com.